In early 2019 the Atwater Library is conducting free financial literacy sessions for seniors with project funding from the Lindsay Memorial Foundation. Please scroll down to see a list of offerings. 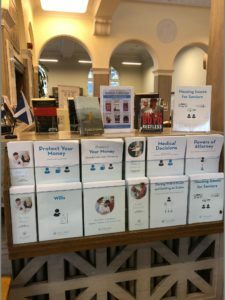 We have a public display of free English-language literature by Éducaloi on our main floor, just inside the Computer Centre. Included are booklets on financial and estate planning. From 2013 to March 2017, we offered free sessions on financial literacy for people planning for retirement and seniors with funding from the Education and Good Governance Fund of Autorité des marchés financiers (AMF). This was preceded by a successful pilot project funded by Canadian Heritage. In 2016, Capital One made a donation. For a lists of offerings, please go to the bottom of this page. Using a variety of formats — interactive seminars, hands-on workshops, and lectures with discussion — we present information on budgeting, saving, investing and estate planning. A hallmark of our financial literacy programming is brand neutrality. McGill University law students with Pro Bono Students Canada conduct a free public presentation. Attendees will have an opportunity to apply for a free notarial will with the selection based on financial need. McGill University law students with Pro Bono Students Canada conduct a free public presentation. Notary Anna Kamateros and Ann Soden, Ad. E., Elder Law lawyer and mediator, conduct a free public presentation. HOUSING ISSUES FOR SENIORS: STAY OR MOVE? Marie-Claude Giguère, founder of Helping Seniors, shares practical information and answers questions about such issues as safety adaptations, downsizing, and assessing options to stay or move. No advance registration. This event is part of our popular Lunchtime Series. Lynn Bennett, Certified Financial Planner, and a computer instructor show how to file an income tax return online. The workshop includes an overview of the new provisions of 2018 federal and provincial income tax laws for seniors — changes from last year. Space is limited and advance registration is required: Richard Cassidy at richard@atwaterlibrary.ca or 514-935-7344 ext’n 206. Jaimie Yue, registered dietitian-nutritionist, founder of NutriVie Santé, shares recipes and tips for seniors to make healthy meals that are affordable. Michèle Payette, Citizen Service Specialist, Service Canada, conducts an information session on Old Age Security (OAS), Guaranteed Income Supplement, OAS Allowance for spouses and common-law partners, issues for immigrant seniors, issues for caregivers, and more. Discussion with Q&A. Diane Skiejka, lawyer and legal plain language specialist with Éducaloi, conducts an information session. Discussion with Q&A. Click here to see the list of 2017 offerings. Click here to see the list of 2016 offerings. Click here to see the list of 2015 offerings. Click here to see the list of 2014 offerings. Click here to see the list of 2013 offerings.